Gorbel's WSJ200 wall mounted workstation jib crane is their most economical light duty jib crane option. These jib cranes are designed to provide coverage in individual works cells or bays, either along a wall or on columns in a plant. 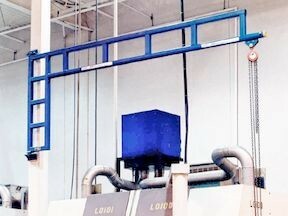 They can be used on their own or to supplement overhead cranes or monorail systems. The light duty low cost of the Workstation jibs can even be mounted directly to machines to allow easy removal of parts or changing of dies. Workstation Jib cranes feature an enclosed track for the boom assembly, which reduces dead weight for easier rotation when compared to traditional I-beam jib cranes. The WSJ200 also includes the trolley for the enclosed track saving you the cost of buying a separate hoist trolley. A structurally adequate wall or column to support the jib crane must exist. Sufficient clearance above the jib crane throughout its arc to accommodate the boom must exist. Hoist Allowance: The total hoist allowance is 15% of the capacity or 22.5 lbs maximum. 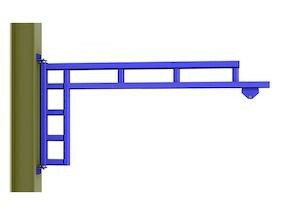 Mounting Requirements: Mounting hardware is not supplied by Gorbel or Jibcranes.com and must be purchased separately. A structurally adequate wall or column is required to support the jib. Please consult a structural engineer or your building manufacturer to ensure that adequate support structure is available.